Hakusan, Japan, May 10, 2018 – EIZO Corporation (TSE: 6737) announced the release of the FlexScan EV2430, a 24-inch energy efficient monitor ideal for business environments such as back offices and control rooms. 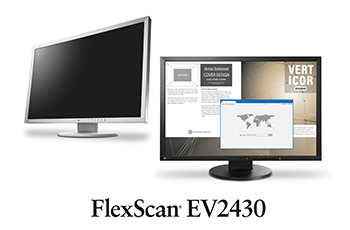 The FlexScan EV2430 has a 16:10 aspect ratio, 1920 x 1200 resolution. It uses an LED-backlit IPS (in-plane switching) LCD panel with 178° viewing angles and 1000:1 contrast ratio, and it has a typical brightness of 300 cd/m2. The monitor features an ergonomic stand that can be adjusted to fit any viewing needs. It has 131 mm height adjustment, 35 degrees upward and 5 degrees downward tilt, 344 degrees swivel and 90 degrees rotation meaning that it can be viewed in a portrait position. The brightness dimming methods of conventional LED-backlit monitors cause many people to see flicker which results in eye fatigue. EIZO uses its own hybrid technology that makes flicker unperceivable even at low brightness levels. Furthermore, in dimly-lit work environments, brightness is adjustable to about 1 cd/m2 which is less than 1% of the maximum. EIZO incorporates its own EcoView technologies to cut down on power consumption. EcoView Optimizer 2 saves power by reducing the backlight brightness and increasing the gain on screens consisting mostly of dark content. Auto EcoView automatically adjusts the screen’s brightness in accordance with changes in the ambient brightness to trim power usage while reducing eye fatigue. A presence sensor called EcoView Sense detects when the user leaves the desk and automatically switches to power save mode. When the user returns then EcoView Sense powers the monitor on again. This feature detects both the user’s movements and body heat for increased accuracy. With these technologies, typical power consumption is just 12 watts. Furthermore the monitor includes the preset mode ‘Paper Mode’ which adjusts the color temperature of the screen to make it appear just like real paper. By reducing the color temperature, blue light is decreased which has been linked to eye fatigue. This makes Paper Mode ideal for reading documents and word processing without tiring.